For the past few years we've been experimenting with making our own small supplies of maple syrup. Few people are aware that such a thing is possible out here on the West Coast, thinking that the Sugar Maples in Ontario and Quebec are the only source. But as I'll show you in this post, you can make your own maple syrup as long as you have a good sized maple tree in your backyard. One thing we're particularly blessed with on our farm is an abundance of maple trees. 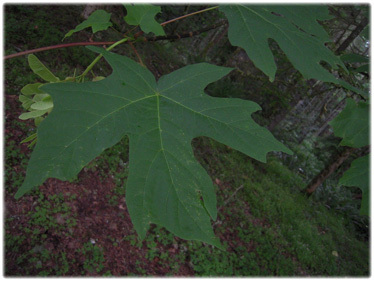 They're known as Big Leaf maples --- the ones that grow like weeds in coastal BC forests. They love the mild climate and all the rain. The first thing you need if you are going to do your own tapping is a large diameter Big Leaf maple tree. You want one that is at least a foot in diameter, or bigger. Big Leaf maples grow everywhere out here on the West Coast. Next, you need to have a power drill with an auger bit (it's important to use an auger-style bit, as it pulls the debris from the hole as you drill, resulting in better flow). 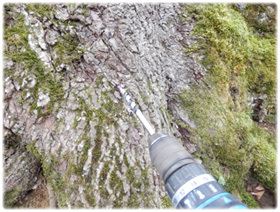 You can drill the hole nearly anywhere on the tree, but some claim the best results can be obtained by drilling on the south (sun-facing) side, within a couple feet of the ground. You drill the hole so it slopes downward slightly, in order for the sap to flow more easily, and around 2 or 3 inches deep. Drilling into the maple tree. flow from the maple tree. You'll also need some plastic spiles. These are taps that you gently hammer into the hole. You can buy them online from a maple-tapping supplier. They're cheap. You can use metal spiles, but the plastic ones are preferred because you can connect them to plastic tubing. I give you more detail in an older post about West Coast maple syrup. You need to run the tubing into a plastic wine bag or even a plastic milk jug, anything to keep the sap in a self-contained system that prevents the rain and bugs from getting in. 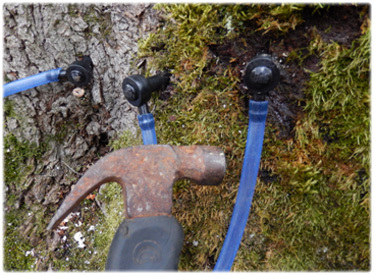 Tapping plastic spiles into the maple tree. Connect them with plastic tubing. The challenging thing about collecting sap on the West Coast is that you don't always know when it's going to flow. Unlike the sugar maples in the east which run consistently for a few weeks at roughly the same time each year, our Big Leaf maples can run anytime during the late fall, winter and early spring. The trick is knowing when. Normally I've found the best time to collect sap is after a period of freezing weather, when there's been a few days of sub-zero cold. 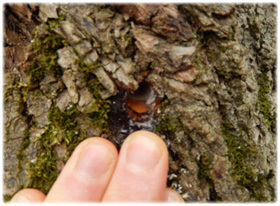 Then, once the weather breaks and you have a few days where the temperature goes substantially above freezing, the sap starts flowing, and can persist for several days. The maple sap is really flowing here. Normally it's a very slow drip. The other challenge on the West Coast is that the holes can heal-up too quickly. I suppose that's good in some ways, but it means you either need to drill another hole or you wait until next year. The holes you drill in the tree will always start to heal up within a few weeks, and by next season you'll see a small scar where you drilled, where new wood has covered and filled the hole. Each season you drill in a slightly different spot. The tree specialists assure us that the tree isn't damaged by extracting its sap --- many Ontario and Quebec producers claim their trees have been producing for decades. As you collect the sap, you can put it into the freezer until you've got sufficient quantity to work with. If you're making a lot of syrup, then you'll need a considerable amount of freezer space. Remember that it takes between 40 and 60 gallons of sap to make just 1 gallon of syrup. 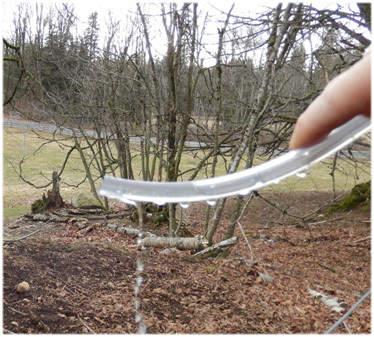 The sap-to-syrup ratio is dependent on the amount of sugar in the sap, which can vary depending on the time of the season and your particular tree. Typically, Big Leaf maples are slightly lower in sugar than the Sugar Maples, so it just means you need to collect a bit more sap in order to make your syrup. And by the way, the West Coast maple sap (in my opinion) tastes wonderful. It reminds me of Evian with a slight hint of sugary-maple flavor. I love drinking it straight from the tree, ice cold. Extremely refreshing. In Korea they drink it by the gallon, for health benefits. I explain more about this practice about drinking maple sap in an older post. Once you've collected the sap you have to boil it down. This just means putting it into a steel pot on the stove and boiling away until most of the water content evaporates into the atmosphere. It will make your kitchen very steamy. You'll know when to stop once the sugar content hits 66-67 percent. I've heard of experts who can tell this visually, but I use a measuring device called a refractometer, which is most accurate. It's like a microscope. Once you're at 66-67 percent, you've got syrup, ready to bottle. Just run it through a filter. Coffee filters will work, although I use a filter specifically designed for syrup. It's important to remember to filter the syrup because it will store better and last longer. Seal it in bottles and store it in the cupboard or in the fridge. Some of our West Coast maple syrup. See how dark it is. 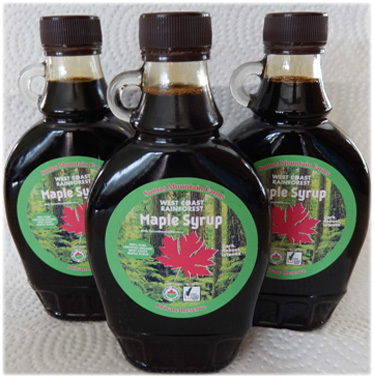 Big Leaf maple syrup is typically stronger in flavor than the eastern maple syrup you buy in the store. This is a good thing. The darker syrup has a higher nutrient content. I call it the "espresso" of maple syrup. I love it, and much prefer it to the eastern variety which I find weak. And it's not just for pancakes. I also put the syrup on yogurt and nuts. Very enjoyable. You can order some from us, although supplies sell out quickly. I encourage others to tap their Big Leaf maples and make their own syrup. It's one of the many joys of winter, and one more way for us to enjoy our abundant West Coast rainforests.